QUESTION: I found out quite by accident I have diabetes. I'd been concerned because of high blood pressure and investigating natural cures. I ran across a site that gave the symptoms and many of them matched what I have now. Then I spoke to a friend who's husband had wounds on his legs that didn't heal and that was what clued her int to his diabetes, a problem I also have. So I moved my research to finding natural remedies for diabetes. I guess one of the reasons I didn't know I had it was because I didn't have the peripheral neuropothy (sp?). It turns out something else I was taking is very effective at controlling it. Astaxanthin with BioAstin. It's great for a variety of things but I was doing some more reading of the research on it and found that it reduced neuropathy. It must be working because when I tried skipping the bioastin then I did start feeling tingling and burning in my feet. Important fact is that wounds on the legs, which can’t be healed and the peripheral neuropathy, are observed during the advanced stages of diabetes. That means that you and the husband of your friend were having diabetes for pretty long time. If you could be able to recognize the early symptoms of diabetes, which are frequent hunger and urination, along with great thirst, that will prevent such complications from setting. Anyways, regarding the diabetic neuropathy and Astaxantin and BioAstin, yes it is true that they are improving the condition of patients with diabetic neuropathy. However, there is another very effective remedy, which is used during the past year for diabetic neuropathy and it is Alpha-Lipoic acid. because there is an individual regime, which has to be followed and I’m not aware of your general health condition. Besides the drugs, which you are taking you can start using Gingko Bilboa, because this natural product is improving the circulation in your limbs. The damaged circulation in the limbs leads to such wounds, which are not able to heal and which are causing a lot of problems. Something important is that the usage of Gingko Biloba will help you handle with the elevated blood pressure of yours. As you probably know, from the research of yours, there are several herbs, used for treatment of diabetes. Some of the most effective one are bitter melon, gymnema sylvestre and cinnamon. You can buy them from the internet or from the nearest pharmacy. However, before start using them, I think it would be better for you to make a consultation with your doctor about your diabetes. The reason, why I’m telling you this is because of the neuropathy. 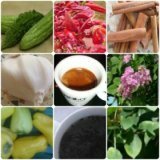 As it was mentioned above, this condition is observed during the advanced stages of diabetes, and during these stages, the herbs alone are not working and they have to be combined with drugs, diet and exercises. Because of this, my advice for you is to continue using the herbs, which you are taking and to start taking those medications mentioned above. In this way, you will prevent further complication and you will start living normal life.